Streaming subscriptions are popular, with 69% of online adults actively using at least one type of free or paid digital media subscription. Penetration is highest among younger than older American adults. 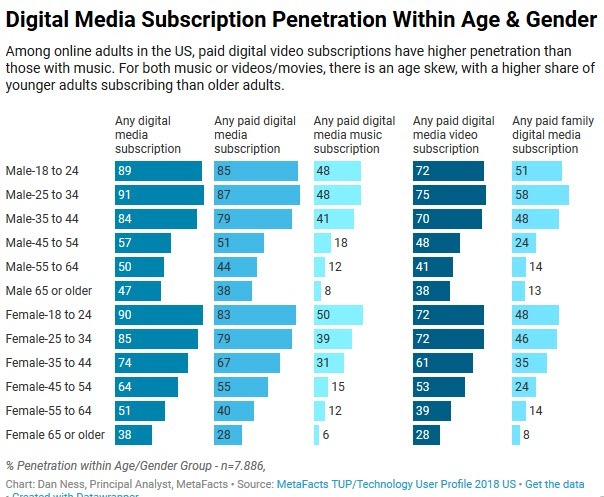 Nearly nine in ten online adults in the US aged 18-34 use a digital media subscription. 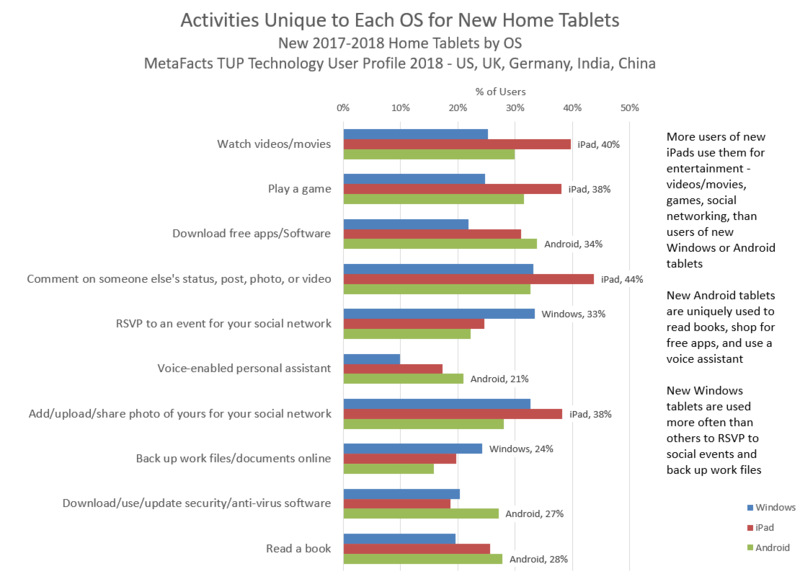 This is based on results from the 2018 wave of MetaFacts TUP/Technology User Profile, based on 7,886 respondents in the US, and 12,680 respondents across the US, UK, Germany, and India. The majority of subscribers have a paid subscription – 85% of all online adults. Only a small percentage of users limit themselves to only free subscriptions, and that’s true across all age groups. Paid streaming music has a lower overall penetration at 28% of online adults. There is a usage cliff after age 44, with penetration being much stronger among younger than older adults. Less than one in five adults age 45 to 54 use a paid media music subscription, and that rate is even lower among the age 55-64 (12%), and 65 or older (8% of online males and 6% of online females). For streaming video, NetFlix is the long-established leader with the highest penetration. 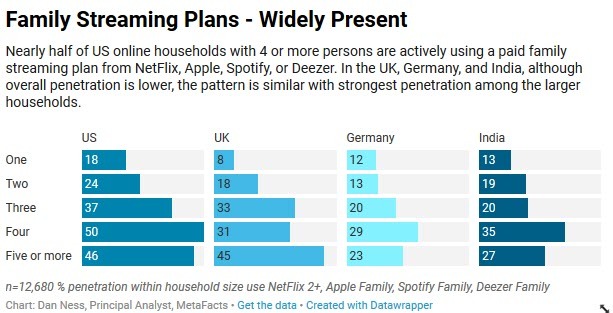 While adoption of the 1-screen plan is stronger than the 2-screen or 4-screen plan in the US and India, in the UK and Germany each plan has comparable use. 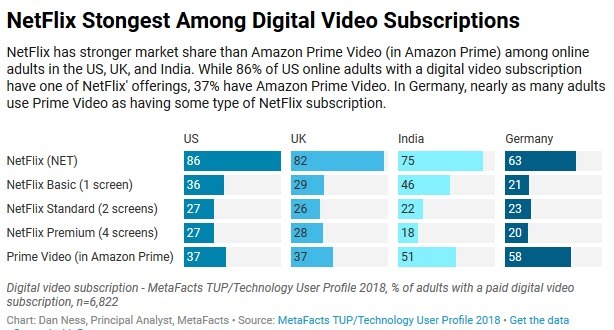 Amazon’s Prime Video offering, although relatively more recent, has reached half the share of NetFlix in the US and UK, two-thirds in India, and near-parity in Germany. Family plans have gained widespread use. 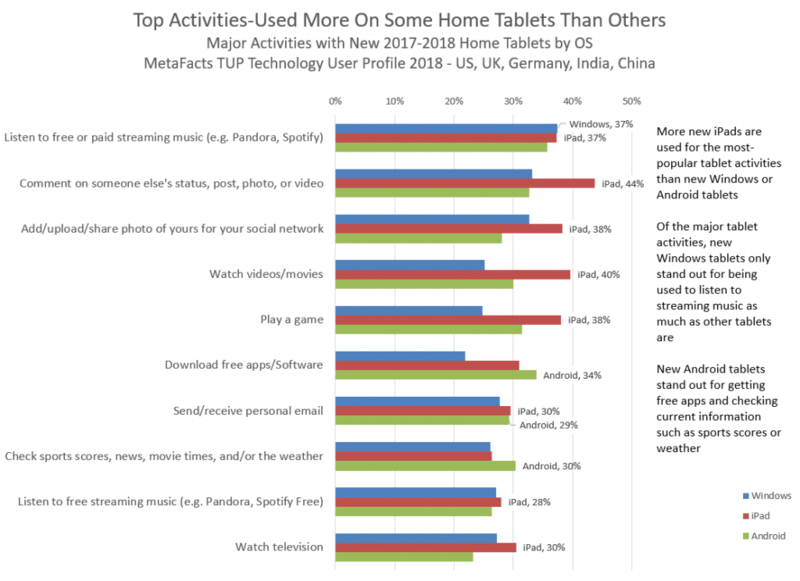 Nearly half of US online household with 4 or more persons are actively using a paid family streaming plan from one of the major services: NetFlix, Apple, Spotify, or Deezer. 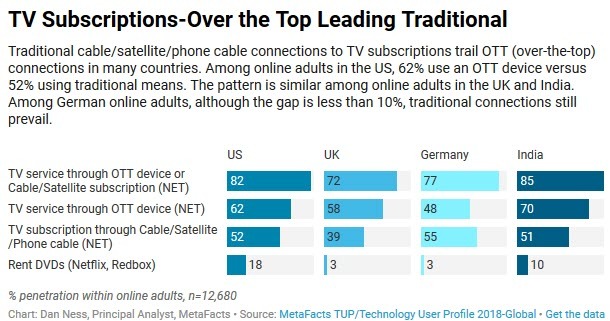 Comparing over-the-top (OTT) digital media subscriptions to traditional TV subscriptions, in the US, UK, and India, active OTT use surpasses the use of cable, satellite, or phone cable TV subscriptions. DVD rental, while diminished, is still a regular practice among nearly a fifth of online Americans, and 10% of online adults in India. When it comes to fun, art, and entertainment, there’s room for many outlets. Although many creators work hard to exclusively own, control and entice viewers and listeners, consumers are free to change their minds and they often do. Consequently, I expect the majority of consumers to continue expanding their subscriptions, both in the number they use and the range of type of media they subscribe to. However, as content providers continue to jockey for position, joining and then leaving various services, consumers will continue to churn between services. Similarly, as existing providers continue to experiment with varied packages – from family and student to single and multi-screen – consumers will join in the experiments, with many switching and swapping between services. In other words, for years to come I expect two opposing forces. Consumers will pay for more than they use, primarily for the convenience of enjoyment when they want it. Also, consumers will continue with their subscriptions through inertia and confusion, without remembering which content is enabled through which subscription. Although subscription fatigue may be growing in awareness, habit consumption will prevail over a reasoned review of subscriptions. The analysis in this TUPdate is based on results drawn from the most-recent wave of TUP (Technology User Profile), the 2018 edition which is TUP’s 36th continuous wave. 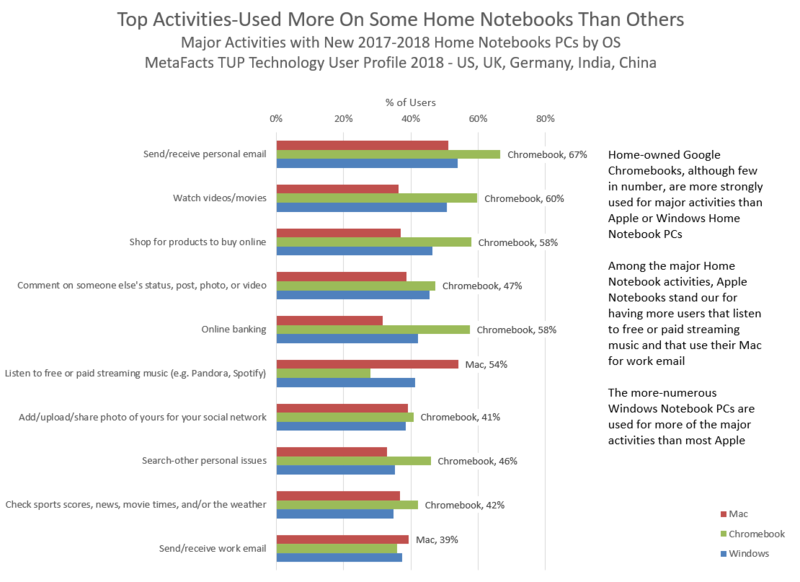 This survey-based study details the use of technology products by a carefully-selected and weighted set of respondents drawn to represent online adults. This specific wave spanned the US, UK, Germany, India, and China.